A musical comedy at the Donmar? From the moment you enter the auditorium and see how Christopher Oram’s design has been translated down to the tiniest of details to create a school gymnasium, it is clear we’re in for something different and The 25th Annual Putnam County Spelling Bee, a self-confessed scratching of an itch to do something fun for director Jamie Lloyd, is just that. 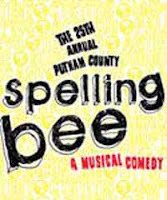 Based around the tradition of spelling competitions at US high schools, it follows a group of six kids aiming to win this contest and qualify for the place at the national final. It also takes the step of inviting audience participation, four people were selected to take part and so the first third of the show is taken up with the early rounds of the competition and the increasingly amusing ways in which they made sure that timely exits were secured from the newcomers. Originally conceived by Rachel Feldman and with music and lyrics from William Finn (I’ve never seen any of his shows, but a song from Falsettoland, 'What More Can I Say', is fast becoming a cabaret staple - Simon Burke, Reed Sinclair and London Gay Men's Chorus just last year - and is utterly gorgeous) and book by Rachel Sheinkin, the show takes the form of a spelling competition but as each child takes their turn to spell, a flashback gives us the opportunity to learn more about these characters, their youthful angsts and ambitions as they struggle to decide who they really are in a world that doesn’t consider them normal. This was a preview performance from Tuesday 15th February, watched in the midst of a large group, not all of whom I sadly got the chance to talk to. Our official spellers are the dorky, barely socialised William Barfée (‘it’s pronounced bar-fay!’), the goofily hippy Leaf Coneybear, the heartbreakingly sweet Olive Ostrovsky (‘if you switch the first two vowels in my name…’), the multi-lingual, multi-talented Asian overachiever Marcy Park, the quirky and liberal Logainne Schwartzandgrubinierre with two overbearing gay dads and last year’s champ Chip Tolentino, blessed with rather more adolescent hormones than he can control ending up in Harry Hepple getting to throw sweets into the audience in the ‘intermission’ whilst singing a song about his 'Unfortunate Erection'. Hayley Gallivan’s Olive (appearing here instead of in the transfer of Ordinary Days) is beautifully endearing and the slow-building relationship with David Flynn’s William is just lovely. Flynn has a ball with his science geek, possessed of an almighty magic foot, Iris Roberts’s Logainne is sweet, Maria Lawson as the precocious Marcy gets a brilliant song, not unlike ‘Show Off’ from The Drowsy Chaperone which she delivers well but I think my favourite of the kids was Chris Carswell’s Leaf, a last-minute substitute, seemingly out of his depth but utterly thrilled to be there and something of a savant, Carswell finding just the right balance of youthful exuberance and bashfulness to win our hearts. Marshalling the unruly kids is former winner turned local glamourpuss Rona Lisa Peretti, played excellently by Katherine Kingsley with warm humour and Vice-Principal Panch who is frequently hilarious with all the best one-liners, most of which come from the sentences given when the kids ask for their words to be used in a sentence: Steve Pemberton is in his element here, dryly funny and quick to jump on anything with comic potential especially where the audience spellers were concerned. Ako Mitchell was very good though, dressed up in the mascot’s outfit and responsible for handing out juice boxes and hugs to the unsuccessful spellers (obviously with a very understanding parole officer!) and doubling up in as parents in some of the flashbacks too. Yet for all I enjoyed it in the theatre, it all felt a little insubstantial in the end and all too easily forgettable. Many of the jokes are throwaway one-liners which rarely linger despite being funny. The songs, whilst pleasant, are rarely essential to the show and aren’t really utilised fully in the storytelling context, there’s not the deep connection between book and score that makes for a truly great musical. And as fun as the audience participation is, it does hamper the development of the ensemble in a structure which doesn’t lend itself much to interaction as these characters are built up brilliantly, but individually. Perhaps there’s an element of over-analysis here since it was at the Donmar and I was expecting more depth and it is a while since we’ve had such an undemanding production there; perhaps the unavoidable positive chatter from those who had seen it on Broadway raised my expectations too much (I can’t say I was moved to buy the soundtrack but maybe familiarity with the tunes would have added something); I did enjoy this Spelling Bee, very much so at times, but I was expecting something a little bit more if I’m honest. (3.5 stars).